Valley of Flowers is one of the most beautiful places to visit in India. It is visited by tourists, pilgrims as well as adventure seekers. Located in the state of Uttarakhand – India, it is now a UNESCO World Heritage Site. It is situated in the middle of tall mountains and is famous for its vast meadows that have several varieties of rare and exotic flowers and various kinds of flora. 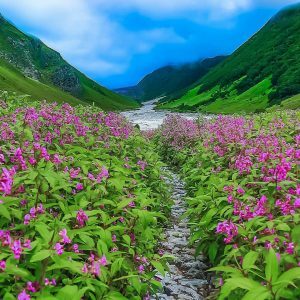 Valley of Flowers trek is highly sought after by trekkers, botanists, photographers, foreign tourists and adventure seekers alike. It is also visited by pilgrims who come to visit Hemkund Sahib, a Sikh place of worship and pilgrimage site. 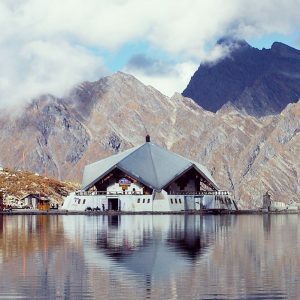 Hemkund Sahib is a gurudwara devoted to Guru Gobind singh, the tenth Sikh guru and is the highest gurudwara in India at an attitude of 4329 meters. The best time to go on a trek to Valley of Flowers is from July to early September. In this period you get to see maximum numbers of flowers. The temperature in these months will range from 7 to 28 degrees Celsius. One can also trek in June, but there are chances of rain. June is a good month for a monsoon trek and to see glaciers, though the temperature is much colder in this month because of the rains. Valley of Flowers is situated close to Joshimath in Uttarakhand state of India. You have to reach Joshimath which is 30 kilometers before Badrinath and then proceed to Govind ghat. Most visitors access the Uttarakhand region from Haridwar or Dehradun. Both these towns are well-connected by road and rail to major cities like Mumbai & Delhi. Visitors can book tickets onboard Mumbai LTT-Haridwar or Delhi-Dehradun Shatabdi Express of Indian railways. Upon reaching Haridwar or Dehradun, you can take a private cab, shared taxi or bus for Joshimath to reach valley of flowers. 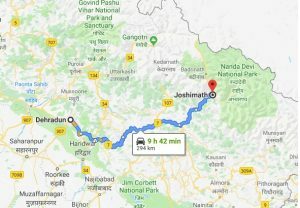 From Dehradun or Haridwar, it takes 9 hours to reach Joshimath. 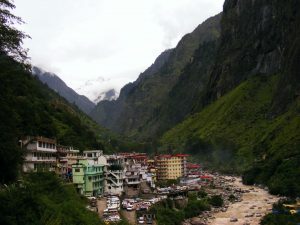 Plenty of shared cabs and taxis are available from Joshimath to Govind ghat. Some visitors prefer to take a halt at Rishikesh and travel to Joshimath the next day. Rishikesh to Haridwar distance is just 20Kms. The nearest airport is Jolly Grant in Dehradun from where one can hire a taxi to reach Joshimath and onwards to Govind ghat. 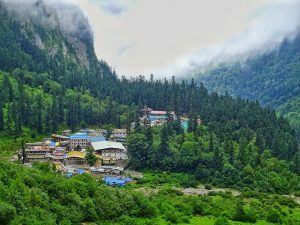 The path leading to both Valley of Flowers and Hemkund Sahib begins from the village of Govind Ghat (1,828 m) which is built on the west bank of the Alaknanda river. Govind Ghat is a cluster of buildings housing hotels, tea shops and various stalls selling footwear, ponchos walking sticks and having transport facilities. At Govind Ghat, you can decide how to reach valley of flowers i.e by Trek, by Mules or be carried by Porters. Visitors especially elderly can hire mules and porters for their journey to Hemkund Sahib. They can hire porters known as Kandi wallahs who carry baskets woven from bamboo and supported by straps across their foreheads and ropes over their shoulders. These Kandi wallahs can carry backpacks, suitcases, bags, children, and elderly in the baskets. For those visitors who are unable to sit on a mule or in a basket, there are other porters know as dandi wallahs, who operate in groups of four. They carry the elderly up the slope to Hemkund Sahib in wooden sedan chairs supported by poles. 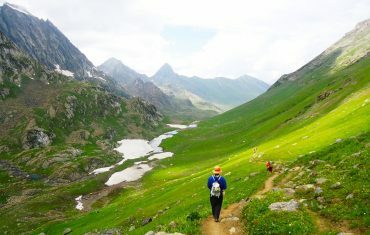 Those who are fit prefer to walk and reach Valley of Flowers without any support. Valley of flowers trek starts from Govind ghat and ends at Ghangaria on day one. This trek is of approx 13 kms and takes around 6 to 7 hours across to reach Ghangaria. The trek begins by crossing the suspension bridge over the Alakananda river and follows a zigzag footpath leading to the steep hillside. At intervals all along the route are small tea shops set up by the local villagers. These shops provide benches for travelers to rest on and enjoy hot snacks, tea and coffee. 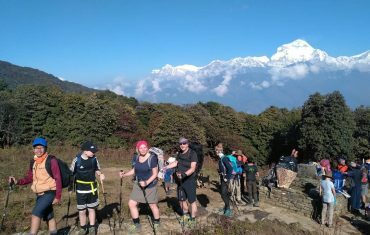 Three kilometers above Govind Ghat, the trail passes Phulna village (2,104 m), five kilometers after phulna you pass Bhyundar village (2,592 m). From here you get a first glimpse of the snow covered peaks. One kilometer further above Bhyundar, you need to cross a bridge over the stream and begin the final three kilometer ascent to Ghangaria. The path from here is steep and rocky and it is advised to take proper rest before doing the final ascent to Ghangaria . As you ascent, you will see snow, waterfalls, gorgeous streams and the mesmerizing Kagbhusandi Lake. Ghangaria also know as Gobind Dham is a small settlement that is around 3 kilometres before the Valley of Flowers. As overnight camping is not permitted in the Valley of Flowers National Park visitors rest for the night in Ghangaria in one of the many lodges open during the season. When the Hemkund Sahib gurdwara opens around June first, Ghangaria opens for business and closes on the first week of October. Ghangaria temperature in these months ranges between 13-15 degrees. From Ghangaria it takes around 2 hours to trek to Valley of flowers national park. Inside the valley, you will cover around 5 to 10 kilometers, exploring the area and seeing the flowers and the sights. The entire trek from here to valley of flowers and back can take around 8 to 10 hours or longer depending upon your speed and rest halts at various stops. On your trek, you will come across sweet scented wildflowers, occasional wild animals, pure white gushing streams, and plenty of colorful butterflies and birds. Some of the flowers species found here are orchids, rhododendron, marigold, Brahmakamal, poppies, yellow violets, Himalayan indigo and primrose. Many tales are spun around the Valley of Flowers – usually about trekkers falling unconscious from the heavy scent of flowers on the valley floor. Whatever the stories, they do have a grain of truth in them, in a good way! It is rare to find a valley so full of flowers. Flowers bloom everywhere in a riot of colors – purple, yellow, white, pink… They blanket the valley in such a way that sometimes, you can’t see the valley floor at all! Spend as much time as you can in the valley and return back to camp overnight in Ghangaria. From Ghangria it takes 4-6 hours to reach Hemkund Sahib, which has the distinction of being the highest gurudwara in India. Pilgrims usually begin their ascent to Hemkund Sahib before sunrise. The path to Hemkund Sahib is stone-paved and is moderately steep to climb on. The path always ascends and there is no flat or sections that go downhill. When you look up the mountainside you can see a saffron-coloured flag atop the ridge above. This flag indicates the location of Hemkund Sahib Gurdwara. En route you pass a forest and then come across high altitude meadows. You can see snow-covered peaks rising in the distance. These peaks are mostly covered with fog and clouds. It may take anywhere from four to six hours to cover the six kilometer distance to the holy lake. The Hemkund Lake is a serene lake in the heart of the mountains and is fed by the nearby springs and waterfalls. Spend some time sitting next to the lake. 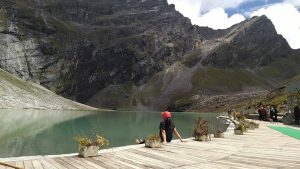 Sitting on the banks of the glacial lake surrounded by seven mountain peaks, it is a treat to the eyes and refreshing to the soul. The Hemkund Sahihb gurudwara has a langar where all visitors usually have their lunch before returning back. Visitors to Hemkund Sahib begin their descent early and try to reach Gobind Dham before the sun sets. The climate at Hemkund sahib is severe and it has limited facilities so visitors are not permitted to stay here. The return path is through the same route to Joshimath via Govind ghat. You may stay overnight at Govind Ghat or Joshimath and leave for Dehradun, Delhi, Rishikesh or Haridwar the next day. Rishikesh to Haridwar distance is just 20Kms, so it is advisable to take a halt at Rishikesh enroute to Haridwar. The Valley of Flowers is one of the most mesmerizing places on earth and visitors have described it as nothing short of paradise on earth. 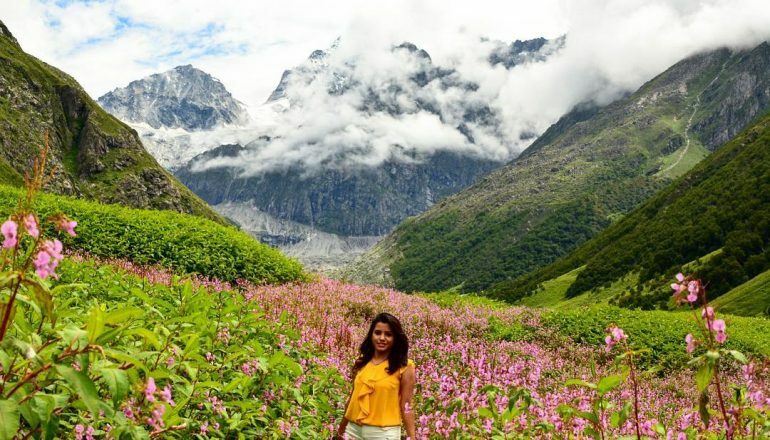 Do plan a visit to the Valley of Flowers. Note : Do not litter in the mountains during the trek. Carry all your waste with you in a bag and dispose it after reaching plains, as mountains have no proper disposal system. Why One Must Visit the Chadar Trek from Altitude Adventure? 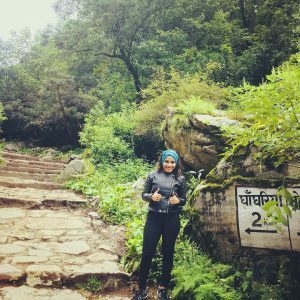 Is the Chadar Trek Safe for Girls? Equipment like tents and sleeping bags are expedition standard and imported by Altitude Adventure India. Online booking for all treks is available with instant confirmation. For Debit & Credit Card Payments – Select PAYPAL in Choose a Payment Gateway. Fill billing details and Click Confirm Booking. For NEFT/RTGS use Netbanking as Payment Gateway.